As the first quarter comes to a close we have 4 pipette and tip promotions to help replenish your stock and stay within your budget. 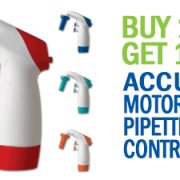 You will find the AccuPet Pro mechanical pipettes and AccuHelp Controllers to be a cost effective solution for your newer lab technicians, teaching labs, and labs on a limited budget. Our Pipette.com Filter Tips and CAPP Serological Pipettes are ideal for every lab. They are made using high quality materials, in a clean room environment. These products are designed to ensure that you get the most optimal results in your research. Not only will these products save you money, they will also make sure that you don’t have to re-do your experiment or lose productivity.